The people believe the government has been mismanaged and demand it be placed in the new hands of a progressive fearless leader. Newly installed, the president presides over his first executive meeting, during which he blithely insults all of his cabinet directors. “I spend all my time and energy to my duties and what do I get?” one pushes back. “You get awfully tiresome after awhile,” the president responds. This is not “fake news” coming from the current White House. This is real comedy courtesy of director Leo McCarey, the credited screenwriters Bert Kalmar, Harry Ruby, Arthur Sheekman and Nat Perrin and four Marx brothers, with invaluable support from Margaret Dumont, Edward Kennedy, Louis Calhern and Raquel Torres. 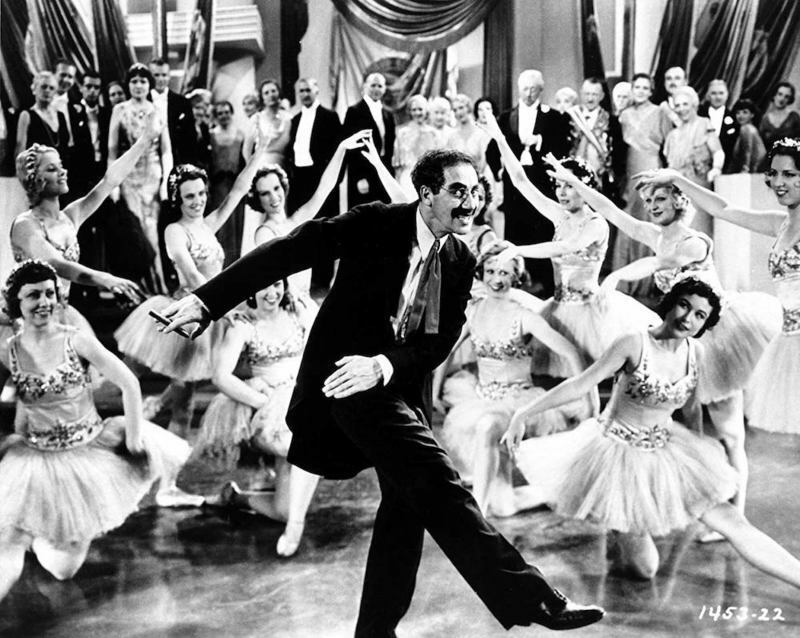 The film was—is—“Duck Soup” and it recently celebrated its 85th anniversary. In 2000, the American Film Institute ranked “Duck Soup” the fifth funniest comedy of the 20th century. We’ll leave for another time whether it is actually funnier than “Some Like It Hot” (No. 1), “Tootsie” (No. 2), “Dr. Strangelove” (No. 3) or “Annie Hall” (you do the math). But it is generally considered by Marx Brothers purists to be the team’s funniest, with no dead spots, gratuitous romantic side plots or even harp and piano solos by Harpo and Chico. It’s non-stop anarchy that was rediscovered and embraced by college-aged Baby Boomers during the Vietnam War, “don’t trust anybody over 30” and Watergate eras. It has been almost 50 years since that last Marx Brothers revival. At a time of seemingly unprecedented dysfunction in our nation’s capital and public confidence in its lawmakers at an all-time low, is it time for “Duck Soup,” with its farcical take on government, to go viral? 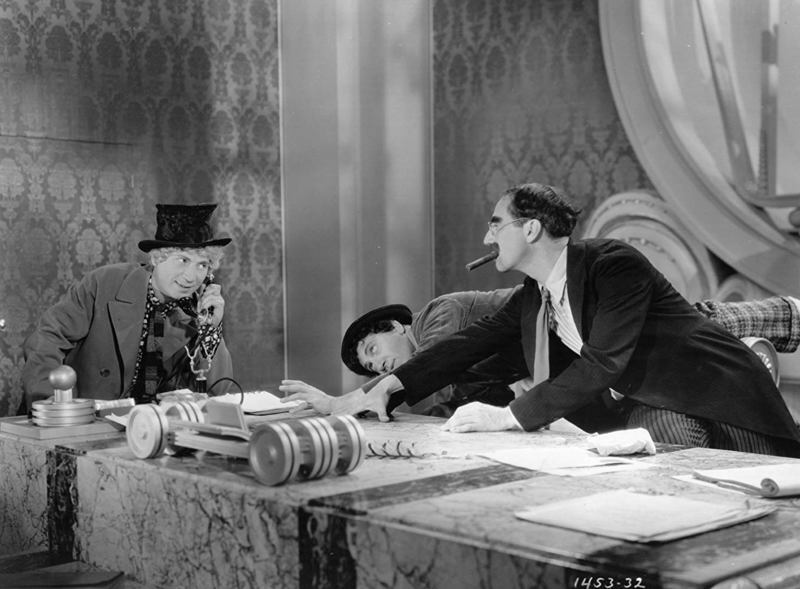 Directed by Leo McCarey (“The Awful Truth,” “Ruggles of Red Gap,” various Laurel and Hardy films), “Duck Soup” is set in the mythological kingdom of Freedonia, where Groucho’s Rufus T. Firefly has been installed as leader by the country’s largest (and don’t think Firefly doesn’t comment on that) financial backer, Mrs. Teasdale (Dumont), Harpo and Chico play two spies hired by Ambassador Trentino (Calhern) of neighboring Sylvania to gather information that would undermine Firefly. Plan B is to gain control of Freedonia is to romance Mrs. Teasdale himself or start a war; whichever comes first. Zeppo plays Firefly’s secretary (he would depart the team following this film). “Duck Soup” was the movie that gave Woody Allen’s suicidal character in “Hannah and Her Sisters” a new lease on life. Monty Python was surely playing homage during Holy Grail’s musical number, “Knights of the Round Table” with the knights’ helmets being played like a xylophone as the Marxes did during “Duck Soup”’s “This Country’s Going to War” spectacular. It is perhaps most famous for its mirror scene, an uncharacteristic bit of silent comedy between Groucho and Harpo. (Here’s Lucy and Harpo’s recreation from "I Love Lucy"). Conventional wisdom labels “Duck Soup” a scathing anti-war satire. Here’s the punchline: It was not intended as such. This according to Steve Stoliar, who as a college student at UCLA in the 1970s led the charge for the re-release of the long stuck in the vaults “Animal Crackers,” which helped revitalize interest in the Marx Brothers, and who chronicled his years as Groucho’s archivist in the memoir Raised Eyebrows: My Years Inside Groucho’s House. Still, Benito Mussolini took offense and reportedly banned the film in Italy. And radicalized American college kids related to the brothers’ irreverence and thumbing their noses at authority. By the way, about that title: several were in play before “Duck Soup,” including “Cracked Ice,” “Firecrackers” and “Grasshoppers.” “Duck Soup” was the title of a 1927 Laurel and Hardy short. But what does it mean? Groucho had this explanation for an interviewer: “Take two turkeys, one goose, four cabbages, but no duck, and mix them together. After one taste, you'll duck soup for the rest of your life."